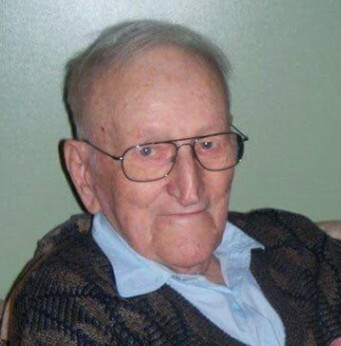 Obituary for Leon Ucasz | Chapman ~ Moser Funeral Home, Inc.
LITTLE FALLS - Leon Ucasz, 99 of the Dillenback Road, Little Falls, NY (Town of Danube) passed away Tuesday, June 19, 2018 at the St. Johnsville Nursing & Rehab. Center, St. Johnsville, NY where he had been a resident since March of 2018. He was born on December 11, 1918 in Little Falls the son of the late Frank and Victoria (Los) Ucasz. He was educated in Fords Bush Rural and Little Falls Schools. He was united in marriage to his wife of 57 years the former Genevieve Kapala on February 11, 1939 at Sacred Heart Church, Little Falls. Mrs. Ucasz predeceased him on March 7, 1996. For many years he was the owner and operator of Ucasz Dairy Farm in the Town of Danube. Prior to his operating the family farm he was employed by the Cherry-Burrell Corp. and the former H.P. Snyder Mfg. Co. both of Little Falls. Following his retirement from farming he operated a small excavating and welding business. Graveside Services will be held at the convenience of the family at St. Mary’s Cemetery, Town of Herkimer. It is the wish of the family that contributions in memory of Mr. Ucasz be considered to the Indian Castle Church, PO Box 172, Little Falls, NY 13365. Envelopes are also available at the funeral home for this purpose.